Not all of our products will make sense to offer on Amazon. The good news is that we have such a wide variety of products and price points that you will still have thousands of options to pick from. There are thousands of fantastic closeout deals and daily new arrivals on top of the thousands of import items we have in stock on a daily basis. In general, the “sweet spot” for selling on Amazon is between $15-$40 retail. We have plenty of products that can retail on their own in that range and many more options when you look to bundle products together. You can easily narrow your search down to this range by using the search by price feature on our website. 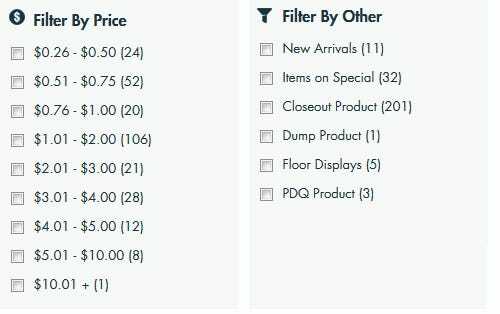 You’ll see in the images below that there are a number of ways to refine your searches and find exactly the products you need at the price points you want. Other factors to consider when selecting your products include restricted product categories, oversized items and fragile items. You can also contact one of our friendly sales reps that will be happy to help guide you in making your selections. Once you’ve picked your products you can download our FBA guide to walk you through the entire process on our website. Click the button below to get started.